Trevor offers a range of different Painting Courses throughout the year to suit all repertoires, covering a variety of mediums (watercolour, oil, mixed media) and techniques. Many of these courses take place in his painting studio just half an hours drive from Bath, in Wiltshire. The 2018 programme for Workshop courses includes Watercolour techniques and practices. Come and learn how to improve your paintings, and spend two days away from it all at Trevor’s studio in The Old Church. For 2018 information see below. 9th & 10th MAY…. 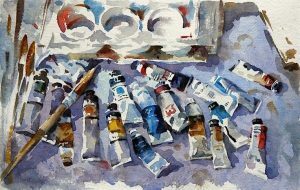 ” Watercolour Extravaganza ” A two day workshop Everything you wanted to know about watercolour but were too afraid to try ! Improve your skills with this fun and instructive course. Large washes, techniques and drying times explained for your best results ! 23rd and 24th May ” Coastal Watercolours ” Instruction given on how to paint reflections, effective looking boats and harbours plus beach scenes and figures. 13th & 14th June … ” Colourful Lights and Darks in Watercolour” Instruction on How To make your watercolours ” Sing ” and get the best results using simple and effective techniques and applications. ( Not to be missed ) Something to suit every watercolorist from beginner to professional ! 5th & 6th September… “Chasing the Light ” in Watercolour. How to make light the main focus in your watercolours. There is nothing more beautiful than a watercolour filled with with light and colour… although, deceptively difficult to achieve ? Trevor demonstrates simple ways of reaching this goal in your paintings…it’s fun, and easier than you think !! 26th & 27th September… ” Watercolour Flower Painting ” A special course to accompany the publication of Trevor’s new book on Painting flowers published by Batsford Press….A must for all who like watercolour floral painting ! How to get to the heart of the matter with handy hints and techniques for more colour and light.